I wanted to bring you all up to date about my most recent love affair!! I have just discovered my serger again, Viking Huskylock 910. He's about 5 yrs iold. His name is "Serge". What brought me to this point was my need to make a pillow case. My very first pillow case! Well, when said pillow case was made, I decided to pull out my serger to finish the seams. You may ask, why not french seams, well I can't really answer that question. Anyway, once I pulled it out, I had to get the book out to figure out how to thread it. Got it threaded, finished the seams and Taaa Daa..........my pillow case!!!!! Lots more to tell you, but for now, this is it. You see, I have a quilt show to go to today!!! 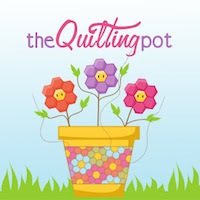 My quilt guild, "Quilters Unlimited" is hosting the show this year. Can you see me doing the happy dance?